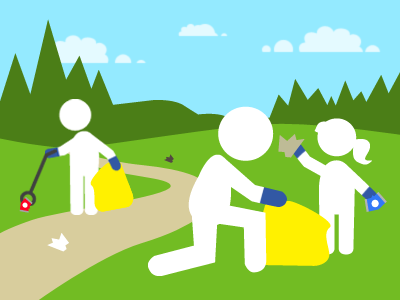 Join Northern New Jersey Cachers, Central Jersey Cachers and other fellow geocachers along with the Warren Township Recreation Department clean up and perform trail maintenance on the Dealaman trail in Warren Township, NJ. What: We will clean up the trail by pruning overhead and trailside overgrowth, pick up blow down sticks and leaves from the winter, pick up trash, and empty fishing line reclamation tubes (as muggles have filled them with trash). Please bring gloves for general safety (but also to protect from PI) and wear sturdy closed-toe shoes/boots and long pants. Bug spray and sunblock are also great ideas. Trash bags and water will be provided as well as a free gift from CoreTex products and other geocaching prizes. If there are enough early logs, shirts will be made for the event. Please note T-shirt size (S, M, L or XL) in log. Everyone who logs an “Attended” at this Cache In Trash Out (CITO) Event earns this year’s 2019 CITO souvenir for their Geocaching profile. Nabgure trbpnpur jvyy or cynprq ba gur nqwnprag Fgenafxl Genvyf gur qnl bs gur rirag.